Bourne Town Harriers have been hosting the Grimsthorpe Castle 10k race and fun run alongside the St John Ambulance fun day in the grounds of the estate for 25 years this year. The fun day and more latterly the Grimsthorpe music festival no longer run and so the race took place independently on the traditional course. The weather was dire but many hardy souls braved the elements and the race goes on alone. Bakkavor Bourne Salads and JO Simms have continued the support given over many years for the event and so the Harriers were able to make a donation from the proceeds of the race. 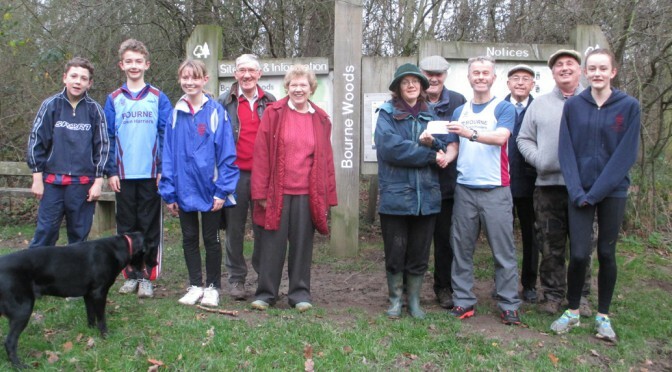 This year they decided to donate £250 to Friends of Bourne Woods. Many of the clubs endurance training sessions take place in the woods, especially in the summer, and the Harriers regard it as a very special place to run.